A full length portrait of a youth standing on a log near the river landing stage at Adok. Beyond him is a rectilinear building that has a small toilet area with corrugated iron screen, and to his right an animal cage visible in other images. 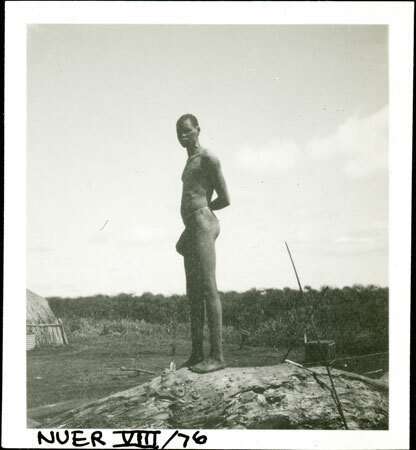 Evans-Pritchard arrived at Adok on 1st October 1936 after making a survey of the Luo of Kenya. He then moved on to spend most of his time among the Leek. Note on print reverse ms pencil - "7 Adok" & print front border ms ink - "NUER VIII/76"
Morton, Chris. "Nuer youth at landing stage" Southern Sudan Project (in development). 03 Jan. 2006. Pitt Rivers Museum. <http://southernsudan.prm.ox.ac.uk/details/1998.355.385.2/>.